A tell-it-like-it-is guide to faking it till you make it when it comes to wealth and class. So you weren’t born with a silver spoon in your mouth. What can you do to not only act like you were but to actually make (or perhaps marry into) the kind of money that puts you in the big leagues? Kerney, who comes from old money, has witnessed firsthand the differences between the haves and the have-nots as well as the manners and outlooks that separate old money from new. For chapters, he divides his guide into subjects close to the hearts of the haves (or the wants): On Vacation; Marrying Up; Name-Dropping, Bragging, Bigotry, and Gossip are just a taste of what an aspiring social queen or king will need to study up on if she or he is going to breathe in that rarified atmosphere. While much of Kerney’s advice is simply common sense—learn your table manners and be able to use them with ease, never condescend, don’t tolerate abuse from your spouse—others border on the absurd: Choose, of course, the less foppish Stubbs & Wooten needlepoint slippers, and if you must wear a Medic Alert bracelet, Tiffany’s gold is preferable. And did you know that occupations are a very middle-class concern? Instead, the haves “are much more interested in your interests and pastimes.” As a study in the milieu of the old-fashioned rich, this amusing book would be almost tongue-in-cheek if it weren’t so earnest. Being extremely wealthy—whether a relatively recent state of affairs or a generational hand-me-down—“takes more than hard work….There are not many people born with all that it takes.” Some of the most interesting parts of the book are the anecdotes about Kerney’s family; his grandmother, cousin and other extended family may have been better served by their own biographies. 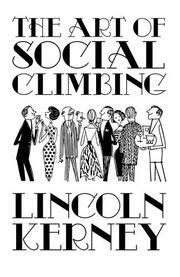 While this book can’t replace the classic tomes on manners and etiquette, it is worth a glance just to see what you’re missing—“top-notch” liquor and caviar, anyone? A (sometimes unintentionally) funny, narrow view of the wealthy that will tickle the outsider’s fancy.